On Saturday Tearfund hosted the Mosaic Conference, bringing together those with a passion for creating new ways of tackling some of the justice issues facing us today. It was more than an opportunity to listen and learn, but to look to turn ideas into something concrete and real. Directly inspired by the conference, Robin Peake who has contributed to this site before gives a sneak preview of tomorrow’s launch of #mynextbuy in partnership with Tearfund Rhythms. Imagine if we lived in a world where children in one part of the globe were taken from their homes and families and forced to make clothes for adults in another part of it? A world where 200,000 young women and girls were trafficked to work in cotton mills, in just one region, in just one country? A world where films were made about the abolition of slavery, while slavery as an industry grew and grew? And what if we Christians – those whom God has called to proclaim freedom for the prisoners and loose the chains of the oppressed – did nothing? On Saturday I was part of the Mosaic conference, a one-day event hosted by Tearfund and their Rhythms team that brought together people who are passionate about pursuing justice in God’s world. After quality speakers and experienced practitioners unpacked God’s heart for justice, we were then provided with the space to play a practical role in fulfilling his call on each of our lives. It was a day not just of listening, but of doing. A day, not just for taking notes, but for taking action. So often, when I’m reminded of what God wants our world to look like, and then look out the window and see how far away it is from that, I feel completely overwhelmed. So overwhelmed in fact, that I do nothing! Mosaic urged us not to be overwhelmed by the statistics that we see, but to be inspired by the stories that we can change. On Saturday, I felt that the time for being overwhelmed into inaction was over. The whole afternoon session was dedicated towards collaborating with others to shape a practical response to specific issues of injustice. I found myself in a group with some incredible people including Andy, who gave away all his clothes to buy a fairly made wardrobe and has started Visible, his own ethical clothing label and Charlotte, who founded the Ethical Fashion Collective and organised and hosted the inaugural Ethical Fashion Week. She’s just 20 years old. In less than an hour we had the beginnings of a campaign, inspired by Stop The Traffik’s Fashion Protocol, to petition Britain’s biggest clothing brands to become more transparent, use contracts with employees as standard, and be open to unannounced and independent audits of their practices. But we knew that it wasn’t enough only for the big brands to change. Their customers – that’s you and me – need to change as well. What could we do when so often we feel overwhelmed into inaction? When a dramatic lifestyle change seems utterly foreign? When the issues seems so hopelessly complex? And then someone suggested that we do something incredibly simple. We simply commit to making sure that the next item of clothing that we buy, is more fairly made than the last one that we bought. Surely we could at least commit to that? And so, #mynextbuy was formed. 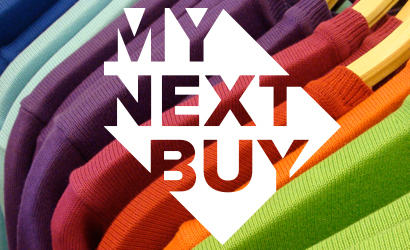 After 3 hours of discussion, and 3 days of emailing, #mynextbuy launches tomorrow! We want to see high street brands pledge fairer working conditions, and we want to make our own simple pledge ourselves: that the next item of clothing we buy, is more fairly made than that last one we bought. It’s a really simple concept. I’ve pledged already. Will you? Sign the Petition. Take the Pledge. Follow us on Facebook and Twitter and spread the word. Of course I care about the environment, but don’t the world’s poorest have more urgent needs? Was Enough Food for Everyone IF worth the effort?